This church-wide intiative to partner with the exceptional non-profits in our community and around the globe was started in 2007 by senior pastor, Andy Stanley. Since then over 35 million dollars have been donated, 483 tons of food have gone out to the community food pantries, and over 336,000 hours have been served. Wow – what an impact that is being made year after year during Be Rich. Debra was a single mother, unemployed and going through a divorce and depression. The Place was able to step in with assistance and give her hope for a future for her and her son. Debra was given food assistance, debt counseling, and workforce development training to help her get back on her feet. program. This included employment services to help restore independence and build self-sufficiency, breaking the cycle of poverty. The Place was able to then offer onsite classes to provide job-skills training, resume building, and interview skills development. 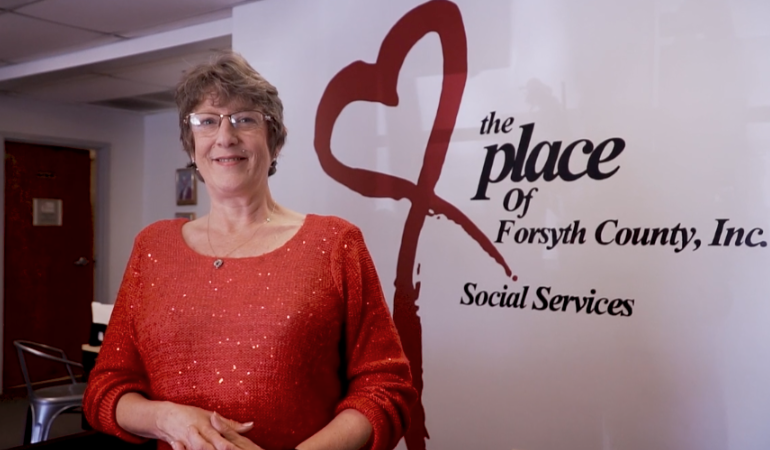 About The Place of Forsyth County, Inc.: For over 40 years – The Place of Forsyth County, Inc., a nonprofit social service organization—has served Forsyth County families experiencing difficult times with basic emergency needs. Their programs include providing food through their client choice market, direct emergency assistance, elderly assistance, workforce development and youth development, as well as operating a thrift store. Our Partnership: For the last seven years Browns Bridge Church and The Place of Forsyth have built a strong relationship with regular funding and a steady stream of volunteers including supporting their back to school drive for Forsyth and Dawson Counties, Food Drives, and Holiday House, annual Christmas gifts for families in need. Be Rich 2017 : The Place from North Point Media on Vimeo. For other ways to give back, check the Volunteer Opportunities in Forsyth County article. 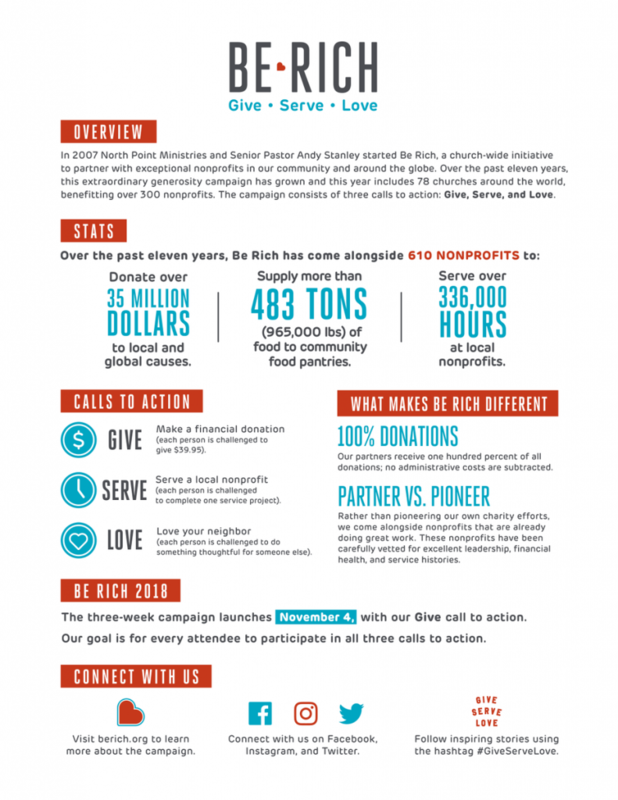 Be Rich includes NPM’s six Atlanta-area churches, North Point Live, and, the many domestic and international partner churches that join us to be rich in good deeds. What started in 2007 as an initiative to partner with exceptional nonprofits in our communities and around the globe has grown into a movement of extraordinary generosity. Our motivation comes from 1 Timothy 6:18: “Command them to do good, to be rich in good deeds, and to be generous and willing to share.” To make this challenge simple for you to respond, we provide specific and organized opportunities for you to be a part of Be Rich. 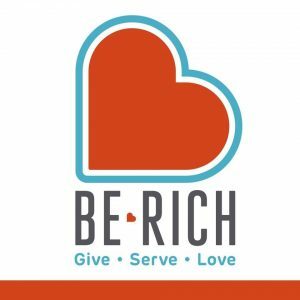 The countless stories from those who have participated in Be Rich over the years show that being rich toward others affects more than just the recipients. Giving money changes the way we view our wealth. Giving time changes our perspectives on our priorities. Generosity releases us from the hold our time and money can have over us. We start looking at the world through someone else’s eyes and that perspective initiates growth in us. 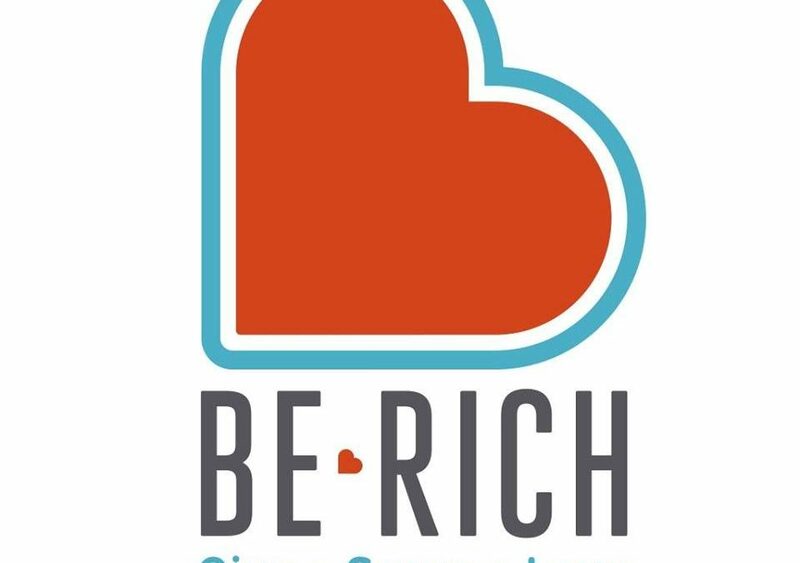 We want to be good stewards of the Be Rich campaign, so we carefully choose our partner organizations. These nonprofits are already doing great work in their communities (locally and across the globe) and have excellent leadership, financial health, and service histories. One hundred percent of all donations* go to our partners and their excellent work; no administrative costs are subtracted. *All financial donations to Be Rich are tax-deductible.